Aleramo, Sibilla (née Rina Faccio). Endimione: poema drammatico in tre atti. Roma: A. Stock, 1923. Apollinaire, Guillaume and Matthew Josephson. The Poet Assassinated. New York: The Broom publishing co., 1923. Baroja, Pío. El amor, el dandysmo y la intriga: novela. 2. ed. Madrid: Caro Raggio, 1923. Billy, André. Apollinaire vivant. Paris: Éditions de la Sirène, 1923. Boto, António. Motivos de belleza. Lisboa: Portugalia, 1923. Cansinos Assens, Rafael. El pecado pretérito: novela. Madrid: Sucesores Rivadeneyra, 1923. Colette. Le blé en herbe: roman. Paris: E. Flammarion, 1923. Colette. Rêverie de nouvel an. Paris: Stock, 1923. Colette and Léopold Marchand. La vagabonde: comédie en quatre actes tirée du roman de Mme. Colette … représentée pour la première fois, le 20 février, 1923, au Théâtre de la Renaissance … Paris: Impr. de l’Illustration, 1923. Cocteau, Jean, 1889-1963. Le grand écart: roman. Paris: Editions Stock, 1923. Duhamel, Georges. Le miracle: suivi de la chambre de l’horloge. Paris: Stock, 1923. Espanca, Florbela. Livro de “Soror saudade”. Lisboa: Edicao da Autora, 1923. Fogazzaro, Antonio. Idillii spezzati: racconti brevi. Milano: Baldini & Castoldi, 1923. Gómez de la Serna, Ramón. El chalet de las rosas: (novela Grande). Valencia: Sempere, 1923. Gómez de la Serna, Ramón. Cinelandia: novela grande. Valencia: Editorial Sempere, 1923. Govoni, Corrad. La strada sull ‘acqua: romanzo. Milano: Fratelli Treves, 1923. Guitry, Sacha, 1885-1957. Un sujet de roman: pièce en quatre acts. Paris: Impr. de l’Illustration, 1923. Insúa, Alberto. El mejor de los tres: novela. Madrid: Sucesores de Rivadeneyra, 1923. Junqueiro, Guerra. Altar. Lisboa: Imprensa L. da Silva, 1923. Junqueiro, Guerra. A torre de babel. Porto: s.n., 1923. López-Picó, Josep Maria. J.M. López-Picó. Barcelona: Edicions Lira, 1923. Martín de la Cámara, Eduardo. Parnaso filipino. Barcelona: Casa editorial Maucci, 1923. Ors, Eugenio d’. Los diálogos de la pasión meditabunda. Madrid: Caro Raggio, 1923. Ors, Eugenio d’. U-turn-it. Madrid: Caro Raggio, 1923. Pirandello, Luigi. La mosca. Firenze: R. Bemporad, 1923. Riba, Carles. Carles Riba. Proleg de M. De Montoliu. Barcelona: Edicions Lira, 1923. Sem. La ronde de nuit. Paris: A. Fayard & cie, 1923. Soupault, Philippe. A la dérive. Paris: J. Ferenczi et fils, 1923. Valle-Inclán, Ramón del. Cara de plata: comedia bárbara, dividida en tres jornadas. Madrid: Renacimiento, 1923. 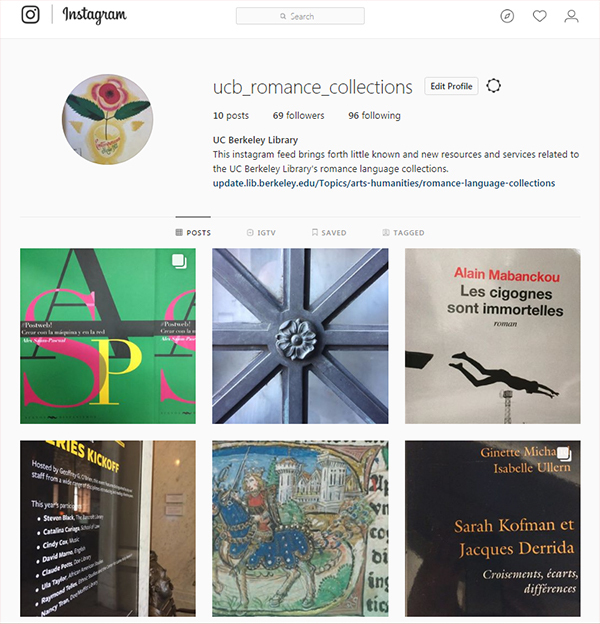 The new Romance Language Collections Instagram feed brings forth little known and new resources and services in the UC Berkeley Library. Once you start following you’ll instantly receive early notices of new books, e-resources, exhibits, readings and more through your smartphone. Jacques Prévert n’est pas un poète by Bourhis Cailleaux. Marcinelle : Dupuis, 2017. Here’s a fairly complete list of most of the graphic novels acquired by the Library in the romance languages from southern Europe over the past two years. Some are critical or reference works, and a few English translations have been included as well. Alexandre Jacob : journal d’un anarchiste cambrioleur / Vincent Henry, Gaël Henry. Paris : Sarbacane, 2016. Alfa, Beta, Bronson / Ramón Rodríguez, José Ramón Grela. Barcelona : Ediciones La Cúpula, 2016. Algériennes : 1954-1962 / Swann Meralli & Deloupy. Paris : Marabout, 2018. America / Nine Antico. Grenoble : Glénat, 2017. Asylum / Javier de Isusi. Bilbao : Astiberri : CEAR-Euskadi, 2017. Avery’s blues / guión, Angux ; dibujo, Núria Tamarit. Madrid – España : Dibbuks, 2016. Blackbird days / Manuele Fior ; translated by Jamie Richards. Seattle, WA : Fantagraphics Books, 2018. Cette machine tue les fascistes / Jean-Pierre Pécau, Senad Mavric. Paris : Futuropolis, 2016. Chateaubriand / Nena, Witko. Nantes : Vide Cocagne, 2016. Che cos’è il graphic novel / Stefano Calabrese, Elena Zagaglia. Roma : Carocci editore, maggio 2017. Como viaja el agua / Juan Díaz Canales. Bilbao : Astiberri, 2016. Corta e cola : discos e histórias do punk em Portugal (1978-1998) / Afonso Cortez. Lisbon : Chili com Carne : Thisco, 2017. Corto Maltese e la poetica dello straniero : l’atelier carismatico di Hugo Pratt / Stefano Cristante. Milano : Mimesis, 2016. Cómic, arquitectura narrativa / Enrique Bordes. Madrid : Cátedra, 2017. Demasiado guapo / Sebas Martín. Barcelona : La Cúpula, 2016. Dr. Uriel / Sento. Bilbao : Astiberri, 2017. Elle(s) / scénario et dessin Bastien Vivès. Bruxelles : Casterman, 2017. El solar / Alfonso López. Barcelona : La Cúpula, 2016. El viaxe a la lluz / Ruma Barbero. Xixón, Asturies : Suburbia Ediciones : Gobiernu del Principau d’Asturies, mayu 2016. El Ángel Dadá : venturas y desventuras de Emmy Ball-Hennings, creadora del Cabaret Voltaire / Fernando González Viñas & José Lázaro. Sevilla : El Paseo, 2017. Espacios en blanco / Miguel Francisco. Bilbao : Astiberri, 2017. 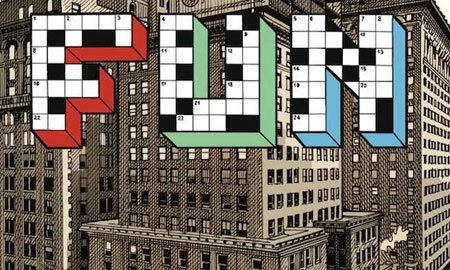 The expanding art of comics : ten modern masterpieces / Thierry Groensteen ; translated by Ann Miller. Jackson : University Press of Mississippi, 2017. Fissa, papa… : de la cité au bled, du bled à la cité / Amazing Améziane. Vanves : Marabout, 2017. Frapper le sol : Tatsumi Hijikata sur la voie du butô / Céline Wagner. Arles : Actes sud, 2016. Freezer / Veronica “Veci” Carratello. Milano : Bao publishing, 2016. Fuga de la muerte / Fidel Martínez. Castalla (Alicante) : Edicions de Ponent, 2016. Fun / written and illustrated by Paolo Bacilieri ; translated from Italian by Jamie Richards. London : SelfMadeHero, 2017. Fun by Paolo Bacilieri. Bologna : Coconino Press, 2014. September is the month when an unusually high concentration of new publications are released to the European market, notably in France and Belgium. While it may take a few more weeks for these books to reach us in Berkeley and get cataloged, some are already making their way to the shelves. Remember, all new books destined for the Main Stacks are first displayed on the third floor of the Moffitt Library and also listed on the recent acquisitions lists for French, Italian and Iberian studies in OskiCat for your convenience. Enjoy! Beckett Digital Manuscript Project – Digitized collection of Irish author Samuel Beckett’s original manuscripts, as well as a digitized collection of his personal library with his annotations. BiGLI Online – Online version of the fundamental print bibliography and discovery tool for Italian language and literature. Includes texts, critical and historical surveys, philogical and linguistic notes, essays, monographs, bibliographic reviews, etc. (1981-present). Brill’s Medieval Reference Library (MRLO) – Contains over 4,000 entries and 200 plus illustrations covering pre-modern European history and culture. The database includes complete coverage of four medieval studies encyclopedias: Encyclopedia of Medieval Chronicle, Encyclopedia of Medieval Dress and Textiles of the British Isles c. 450-1450, Encyclopedia of Medieval Pilgrimage, and Brill’s Encyclopedia of the Middle Ages. Searches can be performed across encyclopedias or limited to one title. International Directory of Medievalists – A directory listing names and addresses of approximately 15,000 medievalists and scholars in fields relating to the Middle Ages in 70 countries. This online title continues the print edition. Routledge Encylopedia of Modernism – The REM is a cross-disciplinary resource for students and researchers covering several subject areas: literature, architecture, visual arts, music, dance, theatre, film and intellectual currents. Over 1,000 articles and over 100 images are included. Browsing by subject, movement and place is available to find information across fields and topics. All new databases are listed on the Library’s A-Z Databases page. 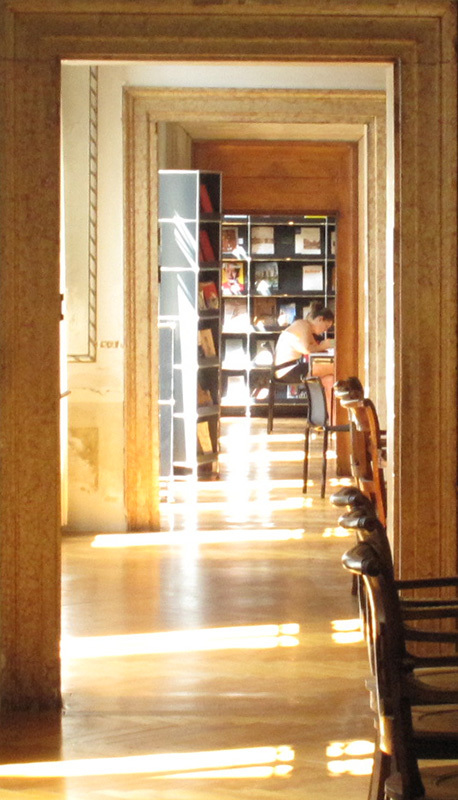 David Laskin’s article in yesterday’s New York Times gave a delectable overview of some of Italy’s historical libraries as not only keepers of intellectual treasures but as physical spaces to carry out research. While web portals such as Europeana or Internet Culturale are bringing us closer to Europe’s rare books and primary resources, conducting archival research in renaissance libraries such as the Biblioteca Nazionale Marciana in Venice, the Biblioteca Vallicelliana in Rome, or the Biblioteca Medicea Laurenziana designed by Michelangelo in Florence will never be completely replicated online. UC Berkeley may not have paintings by Titian or Veronese decorating its reading rooms, but it is home to one of the most significant Italian collections on the West Coast with medieval manuscripts, incunabula, and early modern works in The Bancroft Library, and an extraordinary collection of 19th and 20th century Italian books and journal runs in the Main Stacks. The Library collects in all divisions of Italian history and literature, from the medieval and renaissance periods to the present. For the 20th and 21st centuries, the collection tends to focus more heavily on new literature(s), literary and cultural theory, cinema, historiography, Italian colonial presence in Africa, national and regional identity politics, and comparative studies with other Romance traditions. 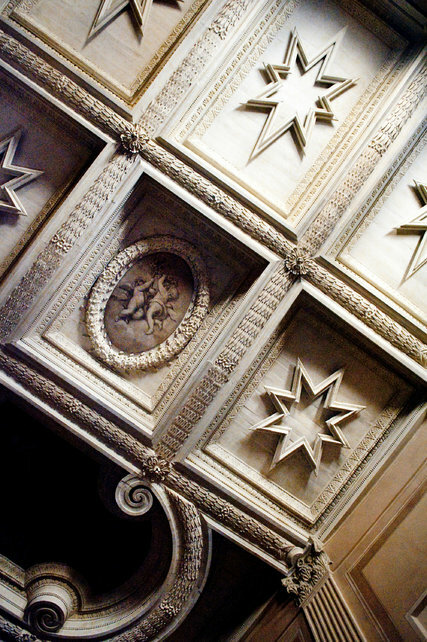 The Art History/Classics Library in Doe, the Hargrove Music Library, and the Environmental Design Library are all places on campus where the Italian collection continues to thrive. 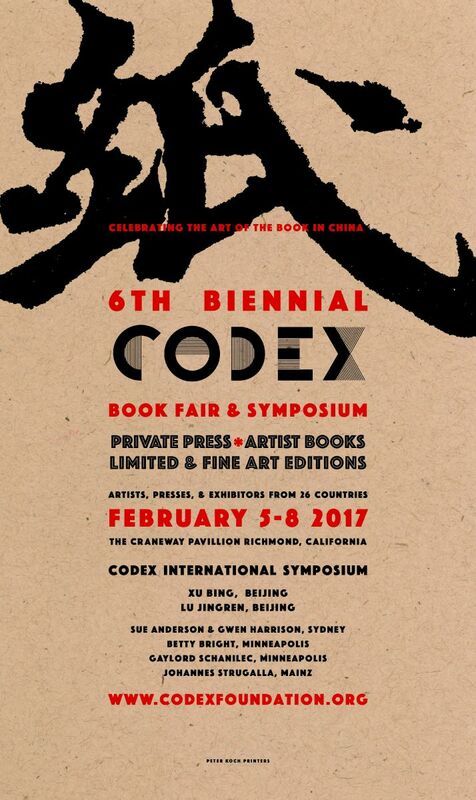 The biennial International CODEX Book Fair and Symposium opens this weekend, February 5-8. The sold-out symposium will be held on campus in the mornings and the book fair at the panoramic Craneway Pavilion in Richmond in the afternoons. The Codex Foundation preserves and promotes the hand-made book as a work of art in the broadest possible context and to bring to public recognition the artists, the craftsmanship, and the rich history of the civilization of the book. Book artists and printers from France, Italy, Spain, and Mexico but also from Argentina, Australia, China and beyond will exhibit. More details including a full list of exhibitors is available on the CODEX website. What’s new in the Library for Fall 2016? 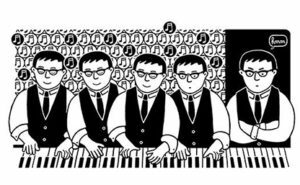 The graphic novel Le piano oriental by Zeina Abirached will be on display in the Doe Library exhibition Beyond Tintin and Superman: The Diversity of Global Comics opening September 19. Welcome back everyone! Here’s a brief sum-up of new services and library resources with a focus on the Romance languages and southern European studies in particular. New Blog – Over the summer the Library migrated all of its blogs to WordPress. From this point forward, please look here for all Romance Language Collections news. If you choose not to subscribe to the blog, don’t worry. I usually forward the most important posts to your respective department listservs. OpenEdition Books – With a combination of generous discretionary and endowment funds, the Library was able to acquire the complete ebook catalogue of this open access book initiative based at Université d’Aix-Marseille. We now have enhanced and permanent access to more than 2700 open access books (most in French but also in Italian, Spanish and Portuguese) that can be read in four different formats (epub, pdf, html, or reader) from prestigious academic presses like CNRS Éditions, Presses Universitaires de Rennes, and l’École française de Rome. We have also have become partners in an acquisitions policy that both supports sustainable development of OA and that respects the needs of teaching, research and learning communities. OpenEdition Journals – Also known as Revues.org, the Library has purchased permanent access to the 140 journals available through OpenEdition’s freemium model, eliminating moving walls and gaining similar formats enhancements as the ebooks. Representative titles include Arzanà: Cahiers de littérature médiévale italienne, Cahiers d’études romanes, Flaubert: Revue critique et génétique, and L’Atelier du Centre de recherches historiques. Ebooks on Casalini’s Torrossa platform – Besides the Italian ebooks the Library receives through its subscription to Editoria Italiana Online, we added 200 additional titles last spring. Casalini Libri also unveiled a new reader in July which greatly improves the readability (especially on smartphones and tablets) of the near 2500 titles in Berkeley’s collection of Italian ebooks. Kanopy and the Media Resources Center – New films and documentaries in the Romance Languages from not only Europe but also Africa and Latin America are regularly added to this online streaming service. Beginning this semester, check-out periods for DVDs and VHS tapes from the MRC will be extended to 7 days for faculty, lecturers and graduate student instructors! 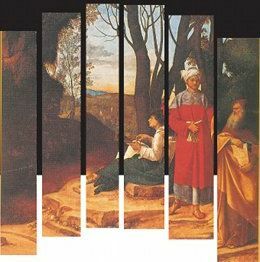 OpenEdition is an interdisciplinary humanities and social sciences portal with four complementary platforms: OpenEdition Books (ebooks), Revues.org (scholarly journals), Calenda (academic announcements), and Hypotheses (research blogs). It is a non-profit public initiative that promotes open access (OA) publishing, with the support of French research institutions. Most of the content is in French but also in other European languages, including English. OpenEdition is an initiative of the Centre for Open Electronic Publishing (Cléo), a unit that brings together the Centre National de la Recherche Scientifique (CNRS), the Université d’Aix-Marseille, the École des Hautes Études en Sciences Sociales (EHESS) and the Université d’Avignon et des Pays de Vaucluse.